It was a 2012 sexism speech by Julia Gillard that brought Australia’s first female Prime Minister to worldwide attention. Because it sealed her reputation for tough talk and plain language. Video recordings of her misogyny speech in Parliament, in which she berated the Leader of the Opposition, Tony Abbott, for sexism and misogyny echoed around the world. Things have changed a bit in the intervening year. The Leader of the Opposition is now the Prime Minister. 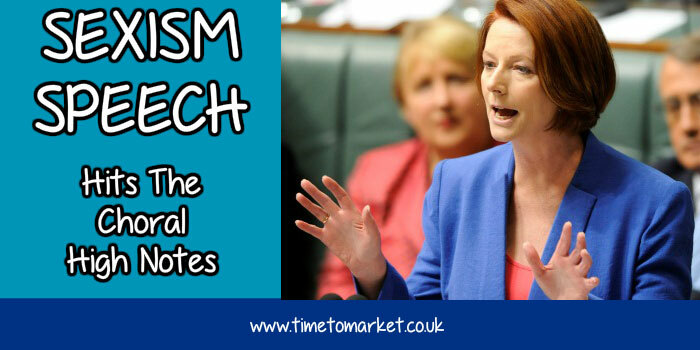 But Julia Gillard’s sexism speech continues to reverberate online. Now that same speech is about to get another fresh new audience. That’s because her sexism speech has been arranged by composer Rob Davidson with the support of the award-winning choir, The Australian Voices. The choir, directed by Gordon Hamilton, has expertly taken the words from her sexism speech in Parliament, fused their melodious nature and produced a choral piece of distinction. We can probably agree that the original Gillard sexism speech was emotionally powerful in the extreme. But the the choir makes her speech even more powerful. They take the original melodies of the Prime Minister’s voice; then they amplify, echo and repeat them. It’s very effective. Very musical and very good fun. The emotion is still there, as is the musicality of the speech’s original delivery. I will not be lectured about sexism and misogyny by this man. Not now. Not ever. The choir gave the choral arrangement, titled “Not Now, Not Ever,” at the opening of the Anywhere Theatre festival. Now they intend to perform their arrangement throughout Queensland at a number of small venues as part of a choral challenge. Their work will turn this particular episode of Australian parliamentary political history into art. Well done. 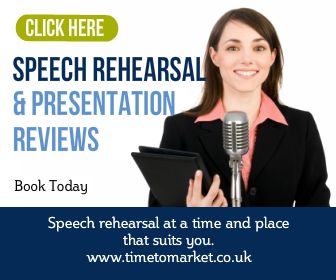 You can always find out tips and suggestions for your own public speaking with our own top tips for speakers. 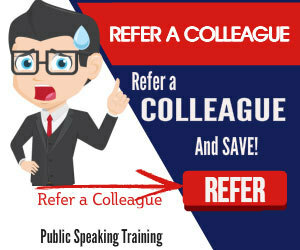 You can read all the tips, listen to the podcasts, or you can join us on a public speaking course. It’s your choice.